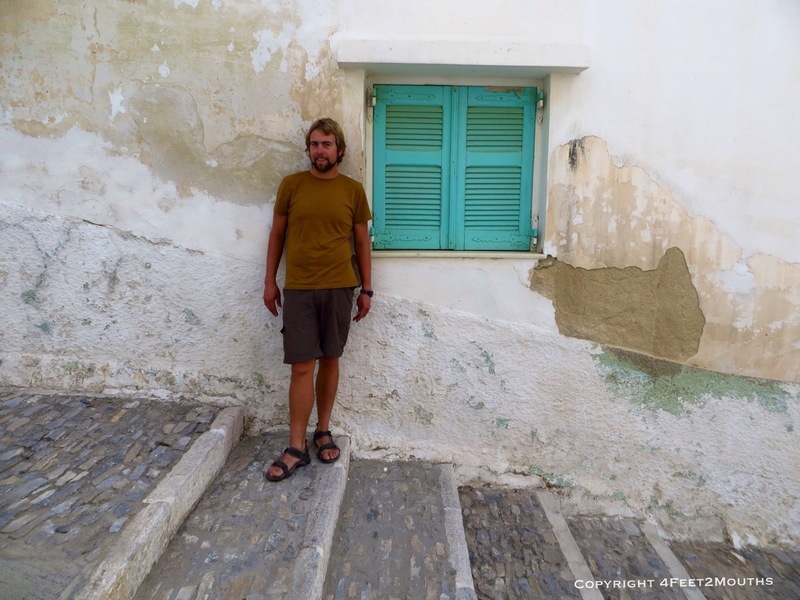 These were my thoughts as I ate my first meal on the Greek island of Syros. Nathan and I were sitting at a table squeezed onto a lovely, narrow lane. 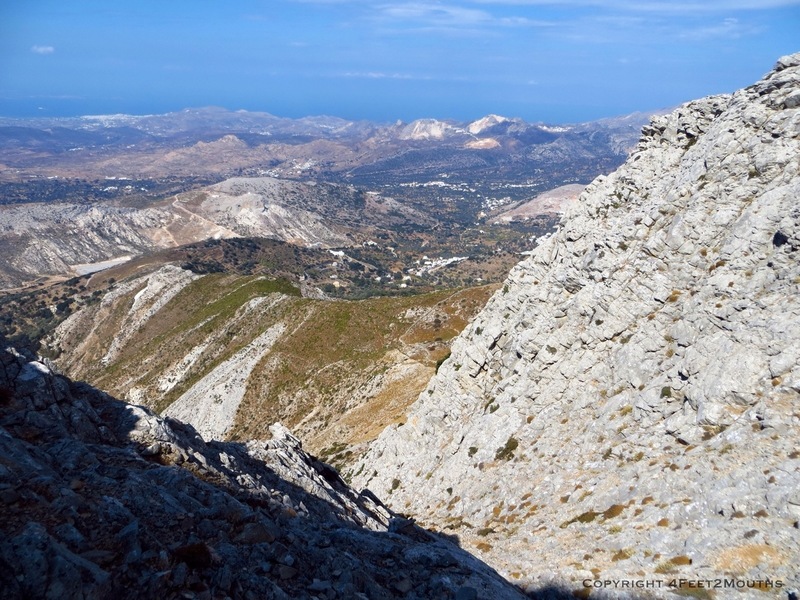 I had just selected some dishes from To Kastri, a restaurant run by a local women’s cooperative. 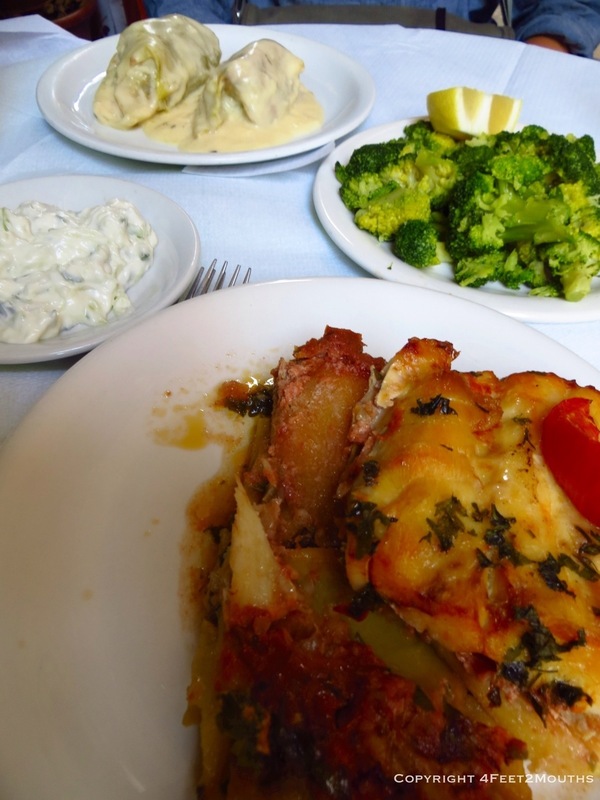 The food was homey and comforting – fish baked with potatoes, broccoli, tzaziki, cabbage rolls stuffed with rice. A wonderful welcome to our first of four islands. After eating, our next thought was beach. We caught a bus to a small cove on the other side of the island and dug our toes into the sand. The water was crystal clear and the beach largely deserted because it was off season. This meant that the restaurants in town were also empty so for dinner we bought a gyro and called it an early night. From our room we could hear the chants of a small, civil protest against the German chancellor’s visit in the distance. 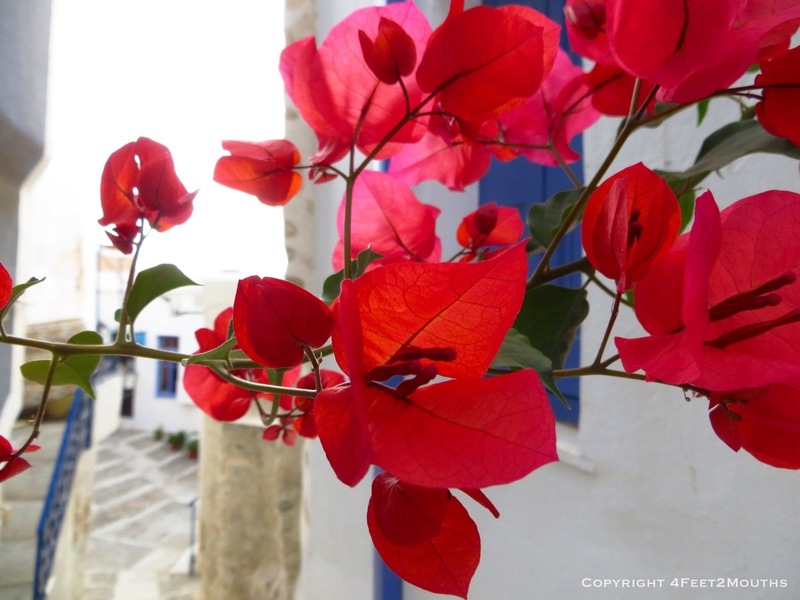 In the morning we awoke early to visit Ano Syros, a picturesque part of town high up on the hill. We snaked our way through adorable alley ways and rustic arches, past weathered doorways and down steep stairs. 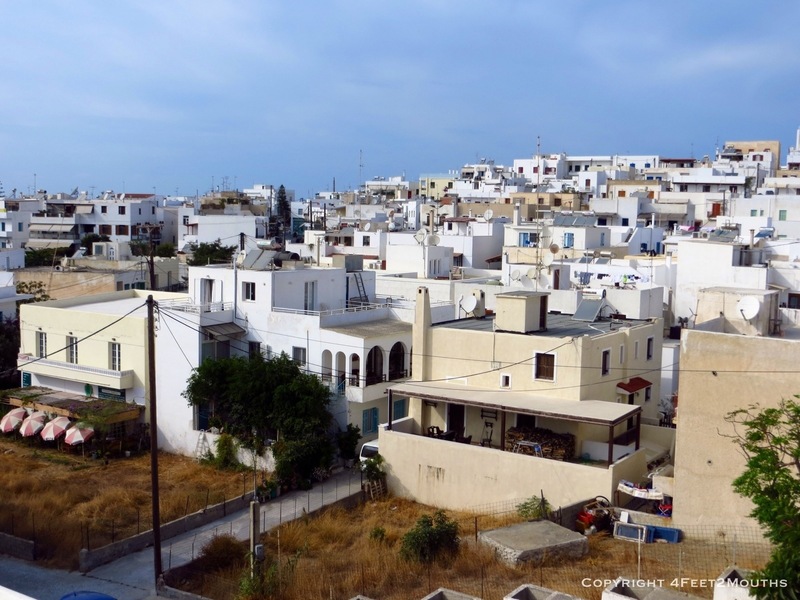 It was exactly what comes to mind when one thinks of a quaint Mediterranean island village. 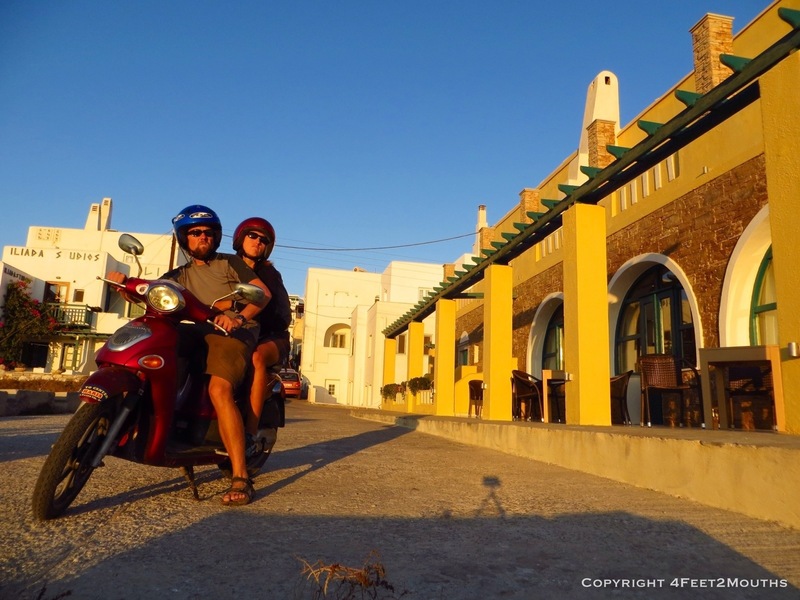 Next we hopped over to the nearby island of Naxos. 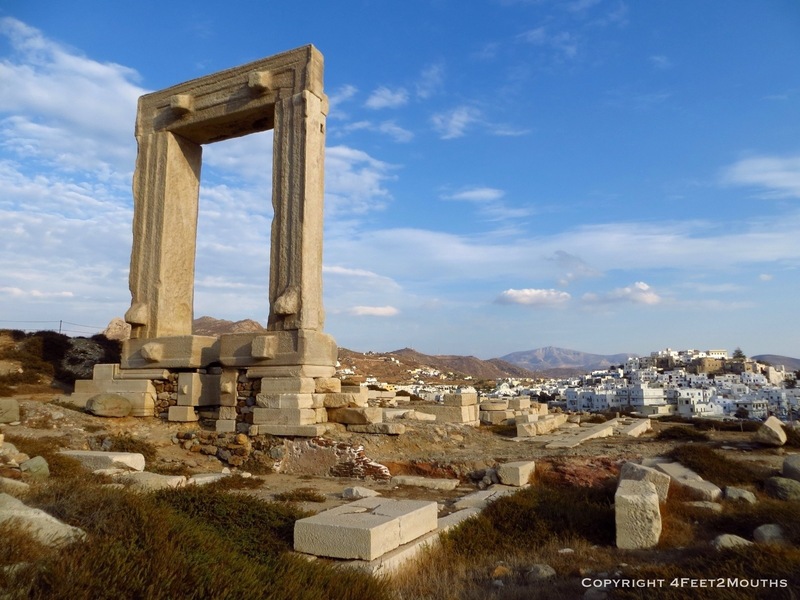 At the port we we greeted with another whitewashed town, this time with the ruins of the Temple of Apollo overlooking the water. We also encountered a gaggle of hotel owners vying for our business. Thanks to Nathan’s master negotiating skills we scored a lovely hotel for under $30 a night. 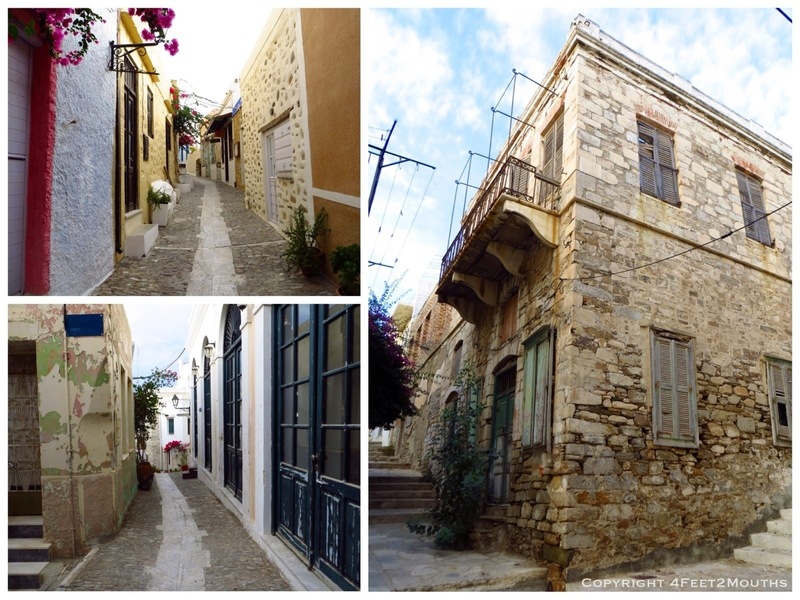 After settling in we explored Naxos old town, which I found even more charming than the one on Syros. It was a true labyrinth with low arches and endless twists and turns. It was the kind of place that beckons your return with the thought that there might be one more passage left unexplored. We walked back to our hotel along the beach and stumbled upon a small resort serving a simple BBQ. We joined in to pig out on Greek-style salads, rice, stuffed grape leaves, and grilled meat skewers. 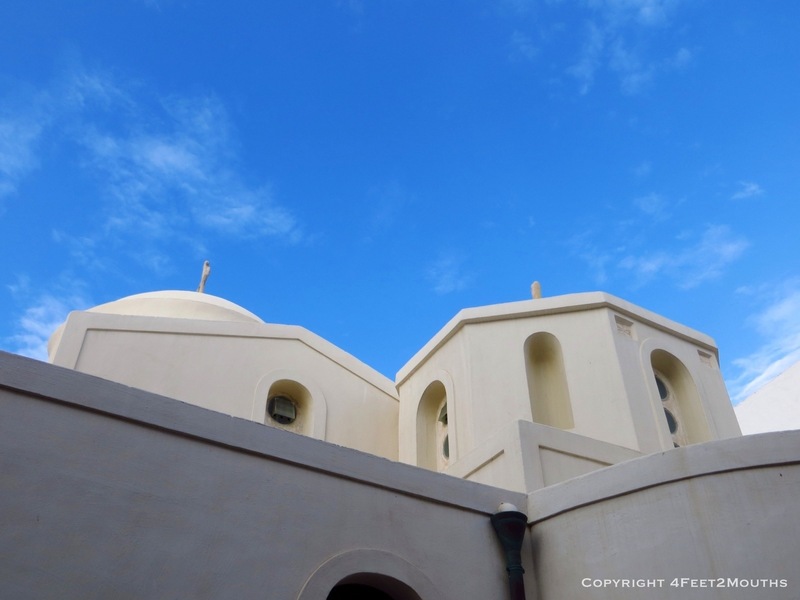 Naxos is one of the bigger islands in the area and there were more villages in the interior to explore. We decided that the best way to do this was to rent a scooter. Now I always knew Nathan had some experience with motorcycles before I met him. 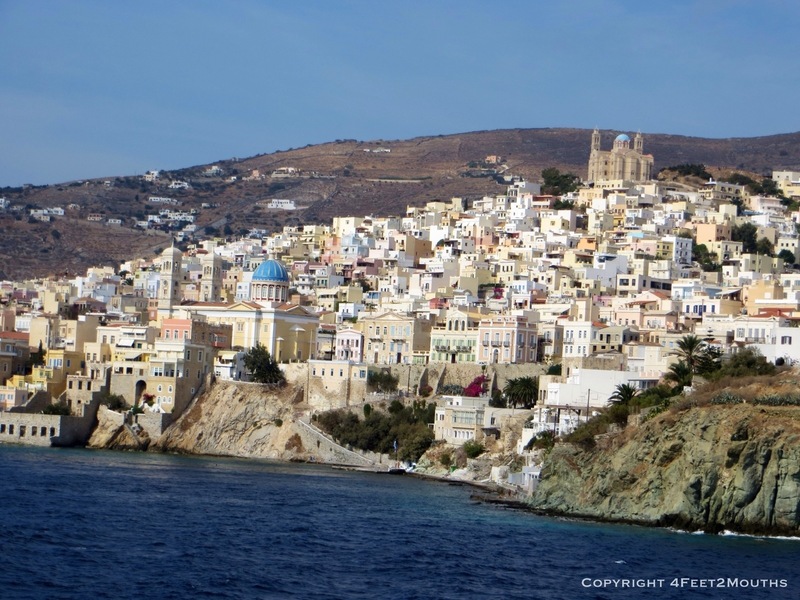 But I was surprised to see how well he picked it up again as we sped off from the Naxos harbor. What an excellent hidden talent. It’s nice to know that after nearly 10 years together you can still learn new things about each other. 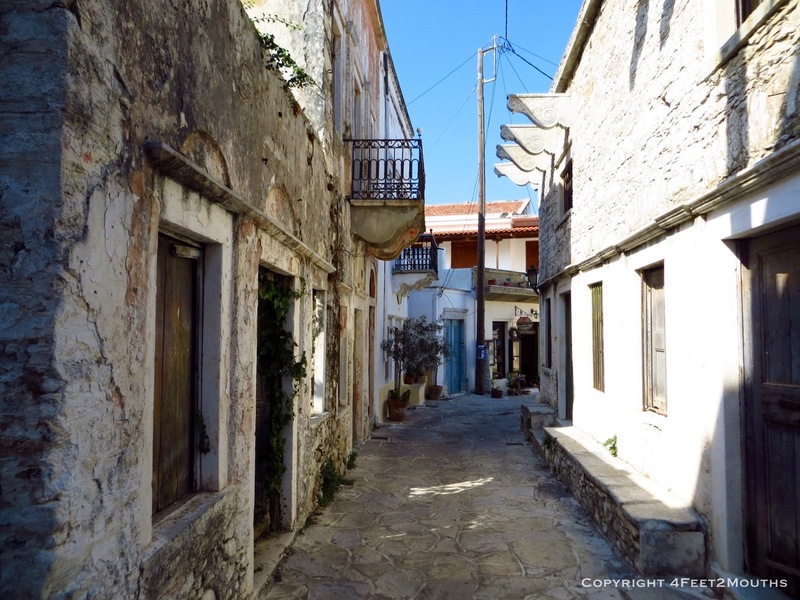 Our destination was Halki, a tiny town with a hundred year old distillery producing citron. This is a drink that uses a citrus fruit unique to Naxos distilled with the local grape liqueur, raki. 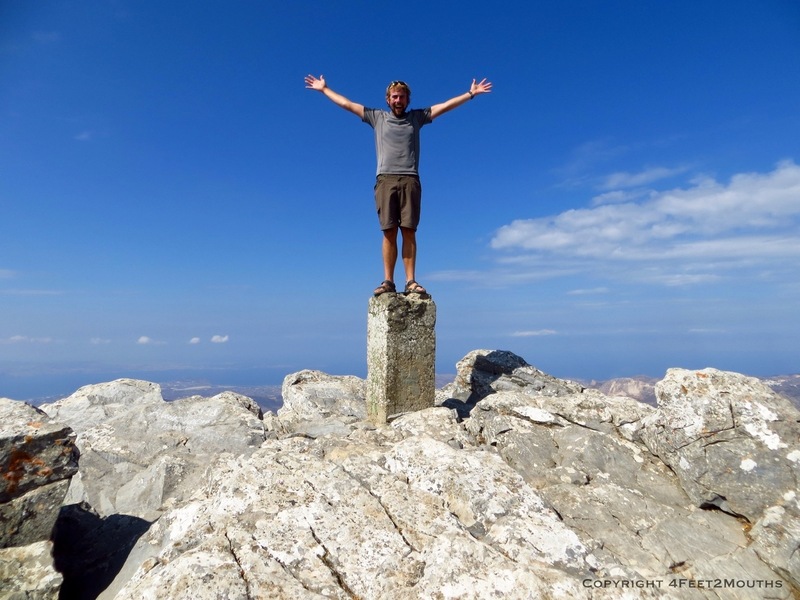 We then scooted on over to Mt Zeus, a 1000m tall mountain with views all around the island. 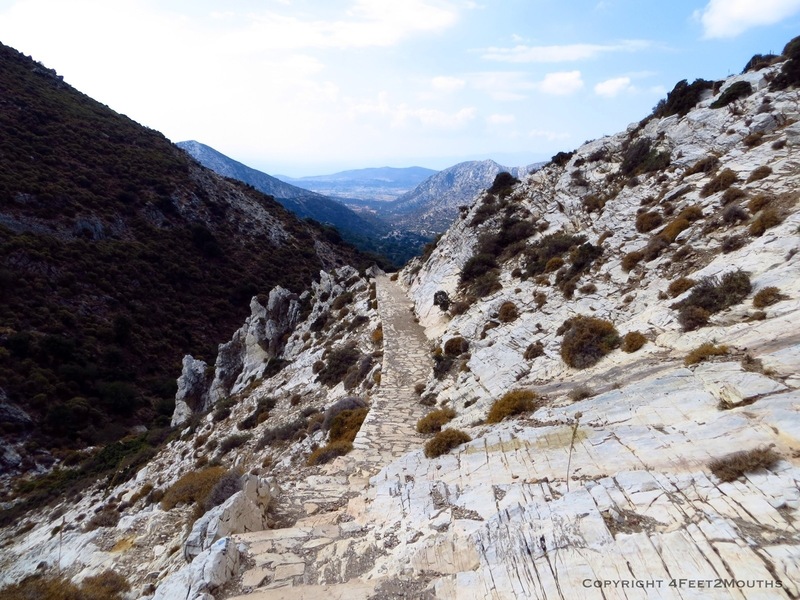 Nathan braved the steep climb while I enjoyed the Mediterranean views from the trailhead. 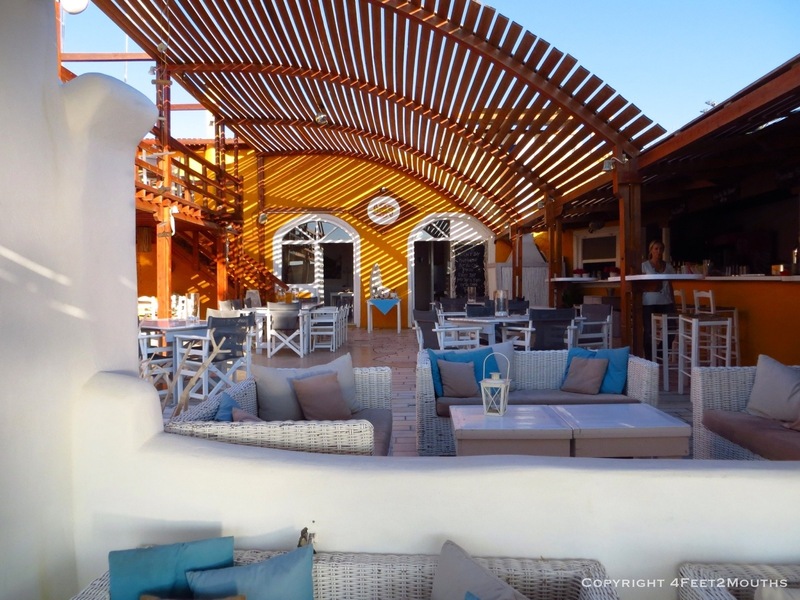 By the time we made it back to Naxos we were hungry for a late lunch. 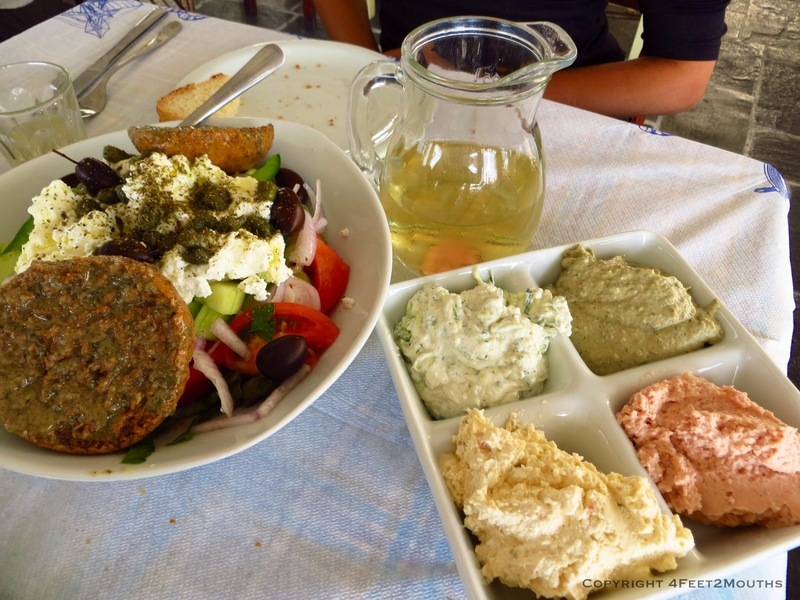 At Meze 2, we ordered a large Greek salad and a mix of dips including tzaziki, eggplant and two feta based spreads. Accompanied by grilled octopus and a jug of retsina wine, we abolished the need for dinner. After lunch we scooted to the beach, albeit more slowly because of the extra weight. The next morning was another beautiful day. 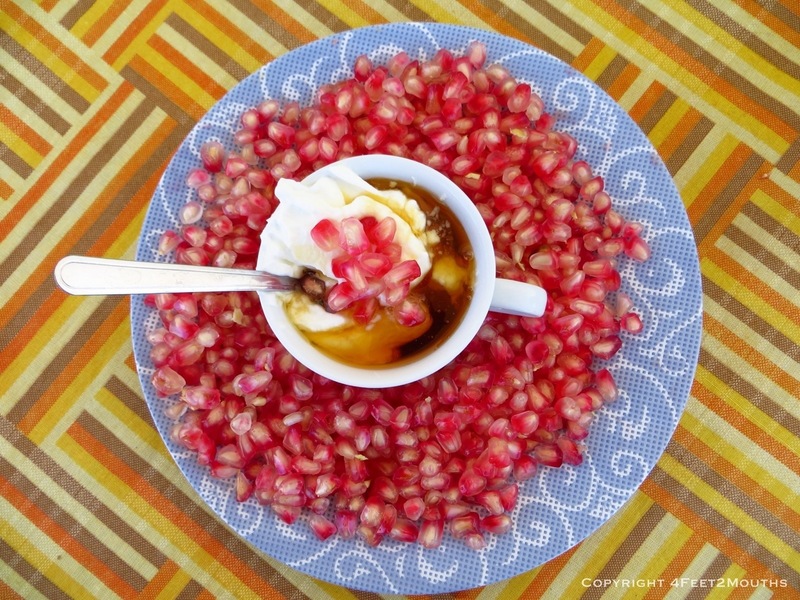 On our balcony we enjoyed a simple breakfast of yogurt, local honey and pomegranate. It was delicious and light, which meant it left room for another delectable snack later that morning. As we passed a small cafe a round filo pastry caught our eye. 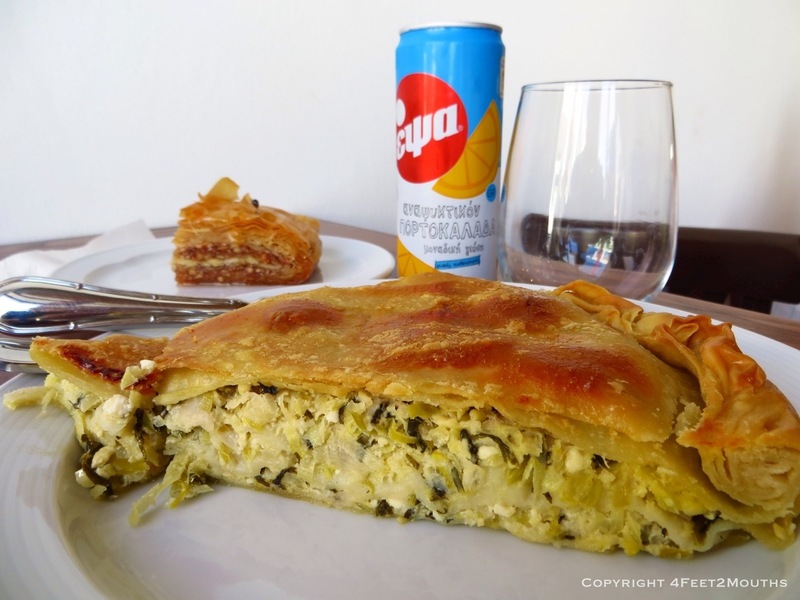 Within minutes we were devouring a slice of prasopita, a cabbage filled pie of sorts. As the last bite passed my lips I was already plotting my return to the beautiful island of Naxos. 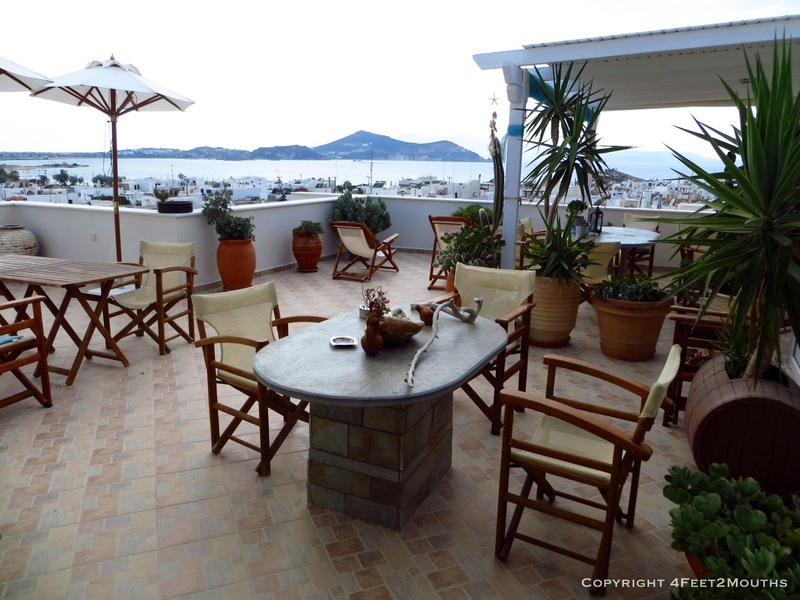 I’ve never been to Syros I think I need to!